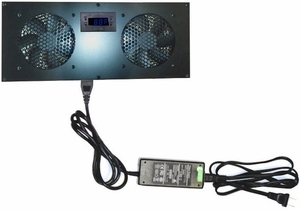 This is a complete kit for quietly cooling your cabinet or multimedia center. This deluxe unit is fitted with two very quiet 1200 RPM fans coupled with our new Thermal Fan Controller with LED Display. On/Off Temperature is easily programmable for maximum cooling. The 12V Low speed fans are are powered by the included power converter and quiet enough to operate in your bedroom. Programmable Thermal Fan Controller with LED Display. The Thermal Monitor comes with a 24" temperature probe that allows for easy placement. Includes a 110v AC to 12v DC Power Supply for powering any 12v device from a standard two prong outlet. (6) 1/2" black Cabinet screw(s) to attach cabinet.